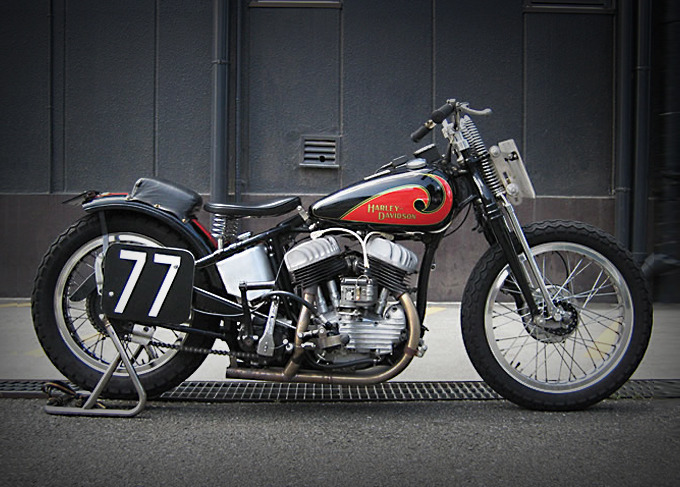 This Harley WLA is owned by Mr Nishida of the Posh Factory in Tokyo, Japan. The Posh Factory make high performance parts for a range of motorcycles but specialize in Harley Davidsons. This WLA was built to race in the AVCC (American Vintage motorcycle Competition Clubman road-race) in Japan and has had some great wins over the years. Nisheda says he loves circuit racing more than anything else, and enjoys meeting people and learning more about vehicle parts through racing which helps them make better motorcycle products. The HD 42WLA was originally built around World War II to US army specs, and apparently were very popular amongst young soldiers who would come home hoping to get a Harley-Davidson like he saw or rode in the war. Not many original WLA’s exist today, most of them being turned into choppers and extensively modified over the years. To check out loads more pics visit the Posh Factory Gallery or to see their huge range of products hit the link to their catalogue. Amazingly their website and catalogue are both in english.